WHY First Aid to Save a Life? Everyone likes to think they are different. We are the same but let me assure you its not just talk. Frankly we try much harder to offer a more attentive, imaginative and enhanced experience and credible learning experiences. First Aid to Save a Life provides the best quality training at very best, affordable and lowest possible rates without compromising on quality of education. 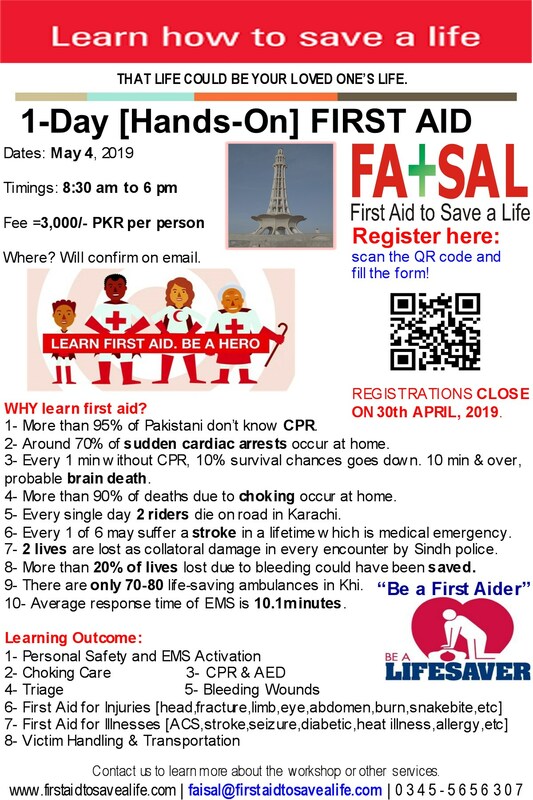 Here is the answer to many questions those may come to your mind that why you should choose First Aid to Save a Life Pakistan for training and consultancy jobs. Internationally acceptable and accredited trainings in lowest possible prices in Pakistan. Why go to other countries to avail internationally recognized and acceptable trainings, when we provide you the training in Pakistan at reasonable investment. Your people have no travel costs, no time off-site. Why travel to the training, when we bring the training to you. We utilize examples and problems from your business in our training, not made-up examples that are just not relevant. We don’t believe one-size-fits-all, tailor-made training solutions are effective. You can’t get those elsewhere! If you choose, we provide optional pre-exams and post-exams, for proof of training effectiveness. We provide training certificates, as proof of education, and training credit, as applicable. We’re ready when you are! We work to your schedule, not ours. Weekend training? No problem for us. Small classes or large classes no problem with us. We provide training unique to your needs. Successful participants will receive (individual) successful certificate with 2-years validity card from MEDIC First Aid International. Training Booklet: Full-color Student Guide Book from approved course contents. A personal wallet skill guide card which can be used for quick reference/revision. Safe and effective first aid response techniques based on G2015 Guidelines for CPRand First Aid. A proven “seeing, hearing, doing, speaking, feeling” approach to learning. Low-stress training with user-friendly materials and positive coaching. Significant classroom time for hands-on practice. Professional adult CPR-AED training manikins (with CPR monitor) for realistic experiences and feedback. First aid supplies for pure training purposes. Automated online bookings which may take 1 minute to complete the online booking process. We firmly believe your training experience shouldn’t stop at the end of your course. All our delegates get access to 24 months of continuous learning links, information regarding any updates in guidelines, support and advice from our experienced trainers. Quality of education is also maintained in accredited training courses where only limited participants are enrolled in one session. We upload course videos on our YouTube Channel from where you can share your memories and learning experiences with your contacts. In our courses we do our best to involve participants in different roles to understand actual requirements and ask him/her to perform how they will react in real life scenarios which enhances their learning, command on presenting the learning to others and learn how to handle the crowd as well to give real life experiences. Also, do let us know if we have missed something which you want to see in our upcoming courses or any other facility which we are not providing in our courses. If you are convinced and really like to hear more from us then please contact us. Click below to join us to get routine updates. This entry was posted in 1-Day Training Programs, First Aid CPR and AED, medic first aid international and tagged 1-Day Training Programs, 2014 training course, 2015, 2015 trainings, 2017, 2018, ABC of Resuscitation, accredited first aid and cpr trainings, Accredited first aid training courses, accredited first aid trainings in pakistan, accredited training program, advance first aid, Advanced First Aid, AED, AED Implementation Program, aed training, aed training programs, aed trainings in pakistan, AEDs, AHA, AHA First Aid Training Courses, American heart association, anti snake venom vials and pressure bandage, anti-snake venom vials, ARC First Aid Training Courses, automated external defibrillator, basic first aid, Basic First Aid and tagged 1-Day Training Programs, basic life saving skills, bleeding control techniques, blood loss, Cardio Pulmonary Resuscitation, control of bleeding in snakebites, conventional CPR training vs online CPR class, courses, CPR, cpr and aed, CPR and AED for Adults, cpr training, cpr trainings, cpr trainings in lahore, defibtech aed, discount offers, discount offers on trainings, emergency care and first aid, emergency first aid, Faisalabad, first aid, first aid and cpr, first aid courses in 2017, First Aid CPR and AED, first aid cpr and aed training in faisalabad, first aid cpr and aed training in hyderabad, first aid cpr and aed training in islamabad, first aid cpr and aed training in karachi, first aid cpr and aed training in kohat, first aid cpr and aed training in lahore, first aid cpr and aed training in Pakistan, first aid cpr and aed training in peshawar, First Aid CPR and AED Trainings in Faisalabad, First Aid CPR and AED Trainings in Gujrat, First Aid CPR and AED Trainings in Islamabad, first aid cpr and aed trainings in karachi, First Aid CPR and AED Trainings in Lahore, first aid cpr and aed trainings in multan, First Aid CPR and AED Trainings in Pakistan, First Aid CPR and AED Trainings in Punjab, first aid for adult, first aid for all, first aid for amputation, first aid for animal bites, first aid for asthma, first aid for baby, first aid for back injuries, first aid for bosebleed, first aid for brain injuries, first aid for breathing problems, first aid for burn, first aid for caregivers, first aid for chemical burn, first aid for choking, first aid for cold emergencies, first aid for concussion, first aid for dengue fever, first aid for ear injury, first aid for electrical burn, first aid for everyone, first aid for fainting, first aid for fall from height, first aid for families, first aid for for not breathing, first aid for for seizure, first aid for fracture, first aid for frostbite, first aid for head injury, first aid for heart attack, first aid for heart failure, first aid for heat emergencies, first aid for heat exhaustion, First Aid for Heat Illness, first aid for heat stroke, first aid for hot water burn, first aid for infant, first aid for patients, first aid for snakebite, first aid for steam burn, first aid for stoke, first aid for sun burn, first aid for unresponsive, first aid is for everyone everywhere, first aid to control bleeding, First Aid Train the Trainer Courses, First Aid Train the Trainer Courses in Karachi, first aid training, first aid training and floods, first aid training azad kashmir, first aid training badin, first aid training balochistan, First Aid Training Courses in 2016, first aid training courses in hyderabad, First aid training courses in islamabad, first aid training courses in karachi, First Aid Training Courses in Karachi Pakistan, first aid training courses in lahore, first aid training faisalabad, first aid training for fitness instructors, first aid training for fitness trainers, first aid training for gym instructors, first aid training for physical instructors, first aid training for physical trainers, first aid training for small businesses, first aid training for teachers, first aid training for teachers in Australia, first aid training for teachers in canada, first aid training for teachers in Gulf, first aid training for teachers in Kuwait, first aid training for teachers in Oman, first aid training for teachers in Saudia, first aid training for teachers in UAE, first aid training for teachers in USA, first aid training gilgit, first aid training guidelines 2015, first aid training hattar, first aid training hyderabad, first aid training islamabad, first aid training islamabad-rawalpindi, first aid training karachi, first aid training kohat, first aid training kot lakhpat, first aid training kpk, first aid training lahore, first aid training multan, first aid training murree, first aid training pakistan, first aid training pehsawar, First Aid Training Programs and tagged 1-Day Training Programs, First Aid Training Programs and tagged 2014, first aid training providers, first aid training punjab, first aid training quetta, first aid training rawalpindi, first aid training rawat industrial estate, first aid training sindh, first aid training skardu, first aid training sundar industrial estate, first aid trainings for free, first aid trainings in 2015, first aid trainings in 2018, first aid trainings in islamabad, flood and first aid training, free first aid courses, free first aid trainings in islamabad, free first aid trainings in Karachi, free first aid trainings in Lahore, HAINES Position, haines recovery position, Hands-Only CPR, hse courses in islamabad, HSE courses in pakistan, hse training courses in islamabad, hse training courses in karachi, hse training courses in lahore, Instructor Development Courses in 2017, international aed training courses, international cpr courses, international first aid courses, international first aid cpr aed training courses, international first aid training center in Afghanistan, international first aid training center in bangladesh, international first aid training center in Bhutan, international first aid training center in China, international first aid training center in India, international first aid training center in Iran, international first aid training center in Maldives, international first aid training center in Nepal, international first aid training center in pakistan, international first aid training center in Saudia, international first aid training center in UAE, international first aid training centers in asia, international first aid training centre in pakistan, international first aid-cpr-aed courses, International Training Certification Course, islamabad, Karachi, Lahore, latest aed guidelines, latest cpr guidelines, latest first aid guidelines, Latest first aid training guidelines, Latest first aid training guidelines of 2015, medic first aid international, MEDIC First Aid International Courses, Medic First Aid International in Karachi, MEDIC First Aid International Trainings in Faisalabad, medic first aid train the trainer, medic first aid trainings, modified haines position, new courses launched in 2014, occupational safety training institute pakistan, online CPR training, oxygen first aid for emergencies, Pakistan, practical snakebite first aid training, practical snakebite first aid training in Pakistan, primary assessment, save a life be a hero, Sindh, snakebite prevention and floods, spinal motion restriction, startup, startup business, startups in lahore, sudden cardiac arrest, training course, training for teachers in canada, training program, trainings, trainings in 2015, trainings in 2018, What does the American Heart Association (AHA) say about AEDs, what is cpr, what is primary survey, what is SCA, why 30 compressions. Bookmark the permalink.